I am an idiot. Repeating the same mistakes hoping for a different outcome is the definition of insanity. But, I'm better than this! Or am I? Well, I've decided to see if I can rebuild. I'm going to hunker down and play good solid poker until I at least get it back to my original buy-in. If Chris Ferguson can turn $1 into $10,000, I can certainly turn this measly BR into $100, right. I can teach you to be a break even player like me. :). 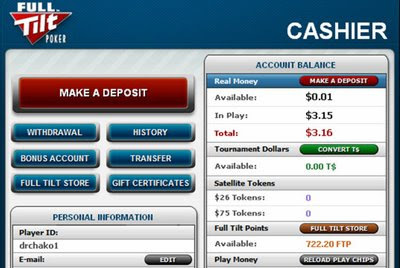 I suggest that building a bankroll from three dollars is going to be impossible for you. I think in part it is very hard to play poker for pennies. Not that it is all about the money but it is hard to focus for a twelve cent pot. I also think the lower levels have more variance from all the retarded play. I suppose this should mean your typical ABC nit game would be very profitable.. but then does it mean you get bored and spew or try a move that would work in your normal game but just loses you money here. Interesting stuff. I personally have never gotten a roll started with less than fifty. I think things like SNGs and even LHE are easier to start building a roll than NLHE where you need a cushion for swings. Good luck anyways. If you need some Waffles bad luck bet to help you I am always up for a little side bet about you busting out or reaching a hundred in a certain time frame. Also some people never get good at online play.. some people are GREAT at reading people live but not as good in the electronic medium. Not everyone can be Waffles you know. :). P.S. GoGrab wow I am getting some good validation words today. Can I just sit back and laugh at you while you loose it all again? I for one wish you all the luck in the world! Not only 'cause I like you, but 'cause you're going to need it at that level. I hate to say it, ('cause it actually hurts!) but Waffles is right. Take the regular variance and throw it out the window at that level. Full on Maniac, (yes I meant that!) donks will explain the rational behind chasing the two gutter cards, right after cracking your flopped set of Aces. To you it's building a bankroll and very serious stuff. But some grandma and her grandkids are going to be sitting there, spending the kids $0.50 allowance. Then there's the others... (shudders) the ones who are everyday nice folk, just sitting around and having fun. You do not even exsist to them, so how can you make a move? How can you protect a bankroll that means absoloute squadoosh to them? Answer is, you can't! What you're talking about doing, is most honourable! "Fix the mess I got myself into and set things right damnit!" Very nice. Un-realistic, but very noble. You know the leak. You're smart enough to avoid it in the future. Re-load when you're ready to focus on playing the way you know you can and double that $100 up. Then make a withdrawl of $100 and buy yourself something frilly! Considering your actual play versus your online antics, I would have to say this solidifies my theory that you cannot get a decent game online. You play much better live than online. Just my trips to the Shoot verify this. Also, my theory (even though I now wear a tin foil hat, is enhanced by the most recent exposure of cheating by Absolute Poker and Ultimate Bet. Chin up Chakster, your bankroll will build in the live games. Hope to see you in Vegas again in the future. Real bankroll management means taking the money seriously even when it is not a serious amount of money. This is also where I fail at BRM. Maybe if you decide to be patient and use the money won playing poker to buy the Bike from earlier post it would provide enough focus for you to adhere to bankroll limits. Or you can dump 50-94% of bankroll into a MTT buyin and take down a big cash. A guy who is a relative nobody is doing a similar challenge to Chris Jesus Feguson, his online name is Brokerstar. He also teaches peoplefor free at the moment. I'm following him as if he can pull it off then t gives me more hope that I'll be able to do it. He is playing No Limit Holdem on a smaler european site that gives neary twice as much rakeback to make the challenge easier. Lol! I've started the same experiment not a while ago. For freerolls I've chosen Pitbull Poker. Freerolls runs every hour and only up to 500 players are playing (sometimes even less). Last week I've won $12.5 and now I'm moving to a cash game :) Wee!